Continuing the series of guest blog posts by writers of fiction, history, essays, and poetry, Emma Straub muses on the two writers who introduced her to the short story. Though I was always aware of short stories as entities in the universe, I didn’t truly read short stories until I was in college, and didn’t truly absorb them until graduate school. It pains me to admit that I didn’t read Flannery O’Connor’s “A Good Man Is Hard to Find” until I was in a workshop with Lorrie Moore, another American master of the genre. Since then, I’ve been working overtime to catch up. The entry points, for me, were O’Connor and Raymond Carver, who taught me about epiphanies and quiet transformation, about condensing the action of a story into an emotional shift. Reading Carver’s story “Cathedral” taught me about slowing down, about lingering in the moment past the point of discomfort. Novels can zip and zoom, but short stories are all about careful observation. Raymond Carver is the writer that I most often think of, in the middle of the day, if some remembered anecdote swims back to me—did that really happen to someone I know, I’ll ask myself, or was it in a Carver story? After I fell in love with Carver, I read everything: all the stories, all the poems. There is something classically American about his work: something laconic and strange, like a John Wayne movie with the sound turned off, playing on a television in the back of a suburban diner. When I write, I aim for that clarity, that assured focus, where you can almost feel the characters shifting their weight from foot to foot, never standing entirely still. 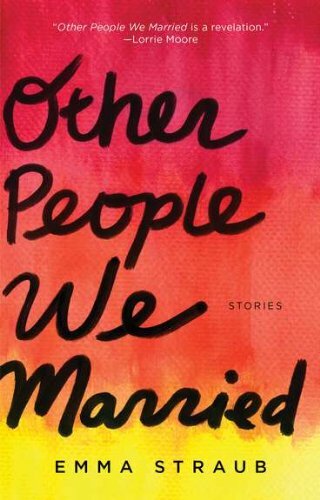 Her teacher Lorrie Moore has called Other People We Married, Straub’s new collection of stories, “a revelation . . . In these stories of grief, love, loss and transplantation, Emma Straub demonstrates her brilliance, her humor, her sharp observational powers, as well as her lyrical gifts and affection for the world.” In the “Approval Matrix” for the week of February 14, New York Magazine placed Straub’s collection in the “Highbrow/Brilliant” quadrant, and just this past week came the news that her forthcoming novel has been signed by Penguin’s Riverhead Books. You can read more about Emma Straub on her blog.